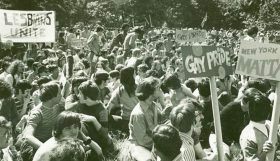 “Where did lesbian, gay, bisexual, and transgender (LGBT) history happen in New York City? In what buildings did influential LGBT activists and artists live and work, and on what streets did groups demonstrate for their equal rights?” These are the questions that the NYC LGBT Historic Sites Project is answering through a first-of-its-kind initiative to document historic and cultural sites associated with the LGBT community in the five boroughs. Through a map-based online archive, based on 25 years of research of advocacy, the group hopes to make “invisible history visible” by exploring sites related to everything from theater and art to social activism and health. To mark Pride Month, 6sqft recently talked with the Historic Sites Project’s directors–architectural historian and preservation professor at Columbia Andrew S. Dolkart; historic preservation consultant Ken Lustbader; and former senior historian at the NYC Landmarks Preservation Commission Jay Shockley–along with their project manager, preservationist Amanda Davis, about the roots of the initiative, LGBT history in NYC, and the future of gay advocacy.